2003 Monterey 322 Cruiser This 2003 Monterey 322 Cruiser has a forward raked radar arch that casts an eye-catching profile on this contemporary classic. Sleek, sophisticated and stylish, the 322 Cruiser has features like a molded-in anchor pulpit, foredeck sunpad, three strategically located deck hatches, and an easy-access walk-through windshield. The oversized cockpit boasts a portside molded-in working wetbar with storage and ice maker. The stylish helm offers a split three-person bench seat, and when it's time to go overboard, there's a large transom swim platform with a recessed, telescopic boarding ladder. The popular extended swim platform comes with its own recessed boarding ladder. Aboard the flagship of the Monterey line, hatches and portholes make the interior a bright, airy haven. A comfortable forward double berth with privacy curtains and a plush mattress means secluded luxury for overnighting. The starboard L-shape dinette converts to a cozy berth. Direct / indirect 12-volt lighting creates a warm, well-lit ambiance enhanced by the rich, robust tones of a premium grade sound system. A well-equipped galley comes with standard coffee maker and microwave oven. 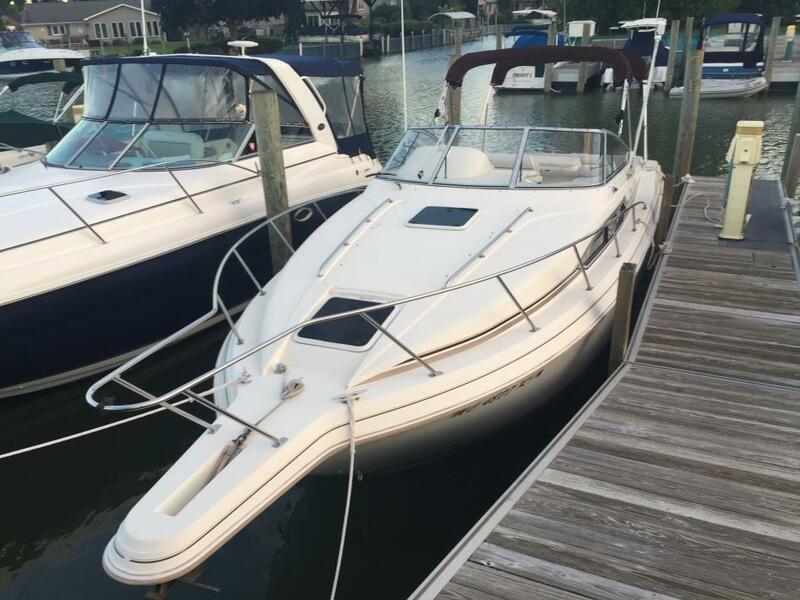 2003 Monterey 253 EXPLORER 2003 Monterey 253 Explorer SUPER CLEAN MONTEREY 253 EXPLORER...GULL LAKE BOAT...WEB PRICING...$26,995 ONE OWNER GULL LAKE BOAT THAT IS IN INCREDIBLE CONDITION. 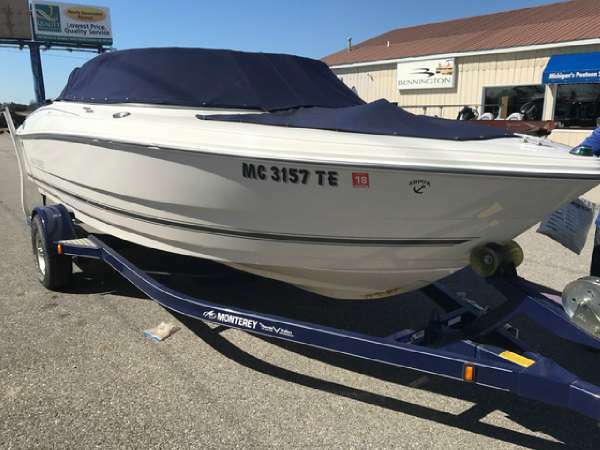 BIG SAFE BOAT FOR A LARGE FAMILY PERFECT FOR THE INTER-COASTAL OR LAKE MICHIGAN BOAT.IF NEW $65,000...BUY NOW AT $26,995 QUALIFIES FOR 2.99% FINANCING RATE THRU APRIL ONLYKept on boat lift on Gull Lake, what an incredible family boat with so much room and space, forward deck step and beach ladder, deep bow seats, twin captains chairs, walk in head that was never used. snap in carpets, little galley unit w/sink & cooler. Huge swim platform pad w/cooler. Big swim deck on the back.Mercruiser power. 5.0MPI V8 fuel injected power with a Bravo III drive. Not the fastest thing out there, but it gets on plane nicely and goes into the low 40's with ease. Professionaly serviced on Gull Lake all it's life. This boat just came in trade this week and was in our storage. We are checking it out and re-servicing and lake demo. 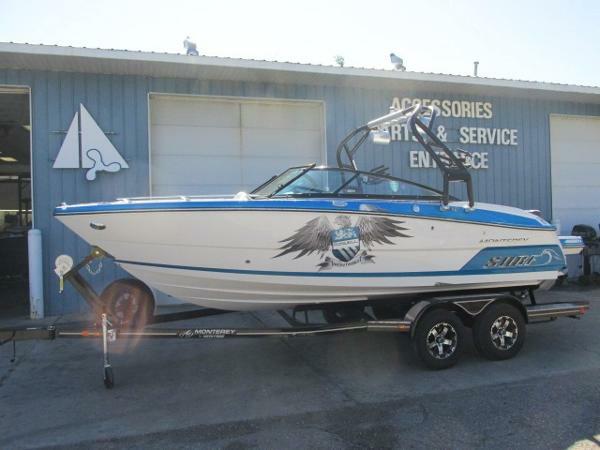 will verify listing with hours when our computer report comes in.Eagle custom trailer is also included.Boat at this time does not have a cover or snap on canvas. It never had canvas as it was under a 28' canopy and then inside heated storage. Upholstery is very good condition, the bottom is excellent, no bottom paint, obviously, an all fresh water boat. some scratches and gouges in the white gelcoat we couldn't buff out. I would say this boat overall is a 8.5 out of 10. 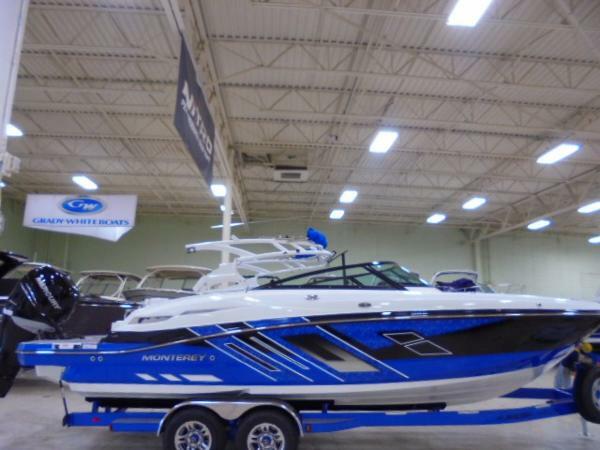 NOTE: on water picture is a file photoContact GULL LAKE MARINE for more details and showing. 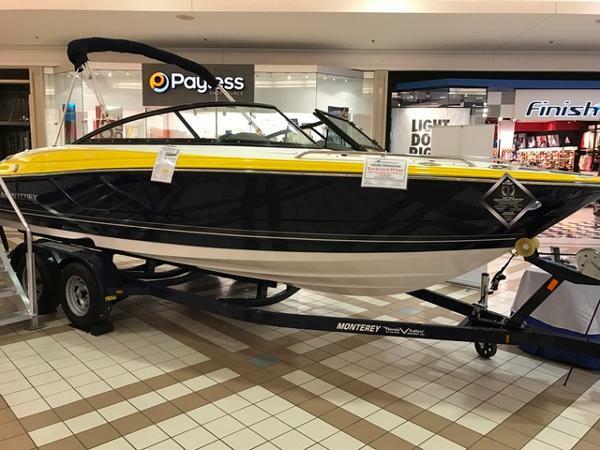 2017 Monterey 224FS Brand new 2017 Monterey 224 FS w/Mercruiser 4.5L 250hp engine on a Phoenix Special Edition custom trailer. SeaDek flooring in cockpit and platform, stainless steel package, battery charger, depth finder, Sapphire Blue hull side w/Sunburst deck stripe, and so much more. 7 year engine/drive/boat warranty too! 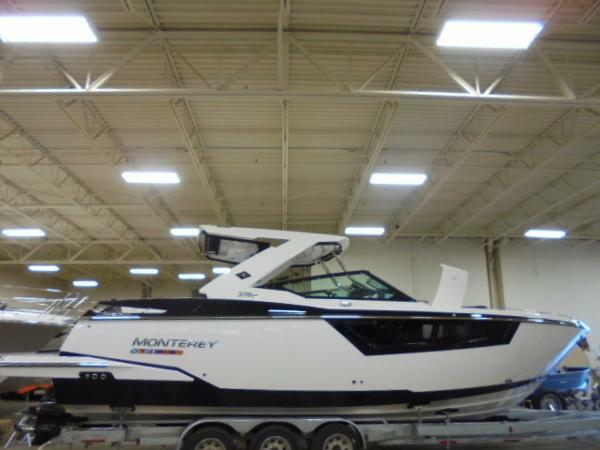 2014 Monterey 288 Super Sport Don't miss this ultra-clean, freshwater bow rider! 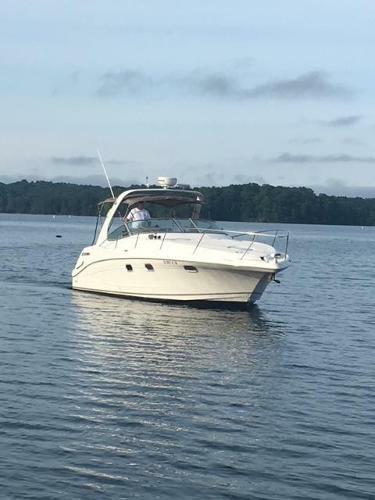 She has been rack-stored year 'round and has all the right options, including a Merc 8.2 HO with Bravo 3 drive, trim tabs, GPS, upgraded stereo, dual batteries, cockpit, bow & bimini canvas with full enclosures, Vacuflush head, anchor windlass and Sea Dek flooring. Please click on 'full specs' and inquire regarding this spectacular Monterey! Please contact us in advance to confirm location and ability to view this vessel. 1996 Monterey 296 Cruiser 1996 Monterey 296 Cruiser, This 296 Monterey is great for family cruises, entertaining, or a weekend getaway. The exterior cabin boasts seating for 9 with a double wide helm seat, port side lounge, and wrap around transom seating. Interior includes forward, mid, and aft cabins with a dining table that can be converted into a bed and sleeps 6 comfortably. This vessel is powered by twin inboard/outboard 5.7L V8 250HP Mercruiser Alpha drives. Engines have 725 hours and have been serviced each off season. 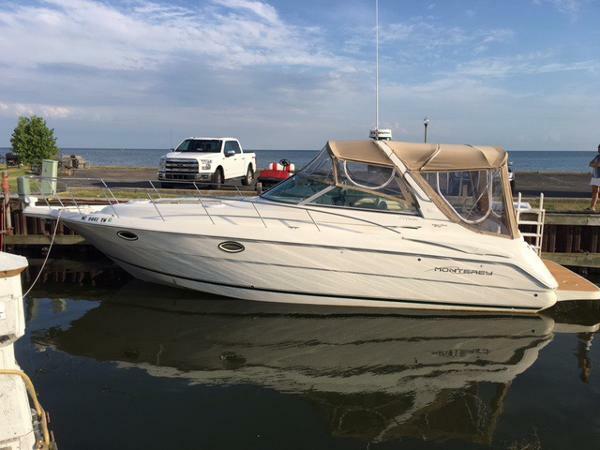 Notable upgrades include a Garmin 741XS GPS w/ depth finder, JL Audio stereo system w/ helm controls, 2 new deep cycle batteries, and an electric Jabsco head pump. Hit the water this summer in this stylish cruiser. 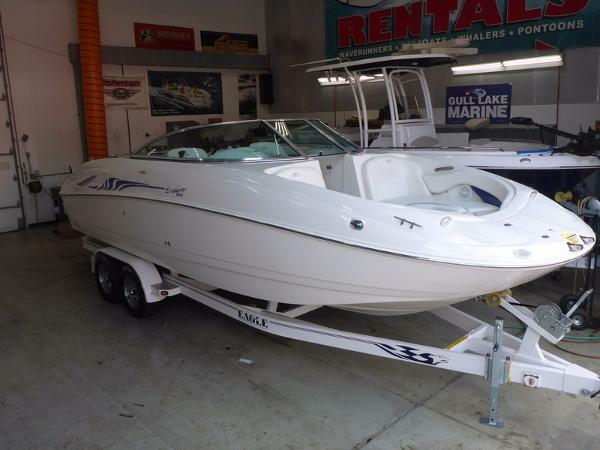 This boat is currently indoor stored and availble to view at South River Marine 30099 South River Rd. Harrison Township, MI 48045. 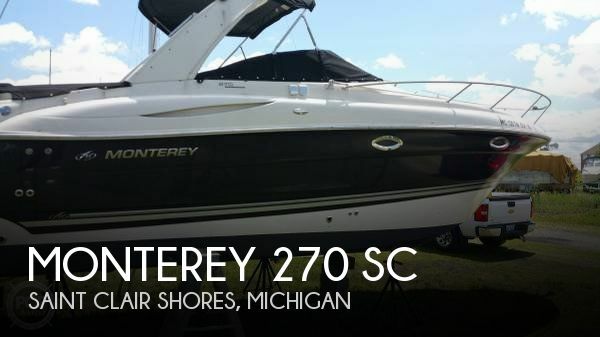 Please contact the listing broker Randy Kluge direct at (586) 484-8211 or email randy@southrivermarine.com. 2017 Monterey M 65 OB 2017 Monterey M 65 Outboard Dual Console. Brand new model - Tons of interior room. Mercury 300 Verado outboard. 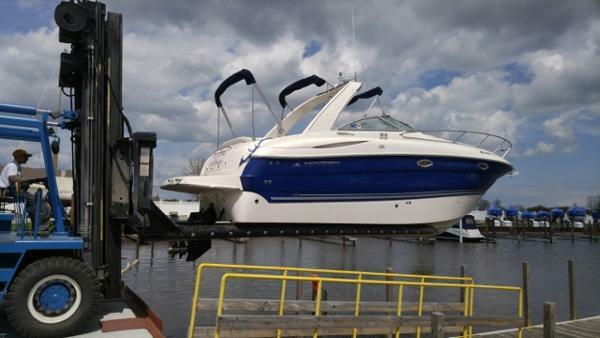 This boat includes a wakeboard tower. Trailer not included in price. 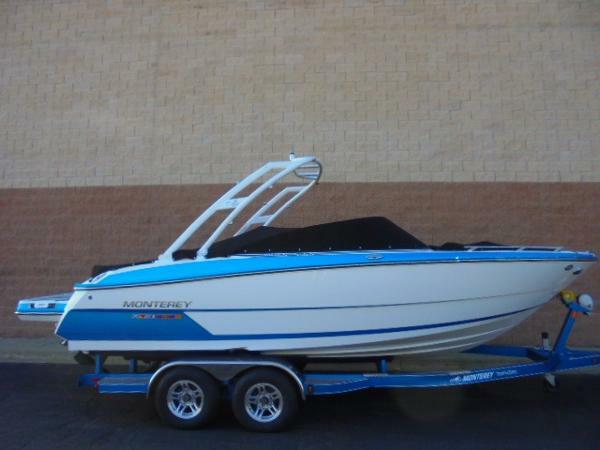 One can be added, Aluminum I beam trailer $5,499 or a Phoenix custom made custom painted trailer is $6,999 Color - Pacific blue/Black Options on this boat include: Mercury Verado 300 hp. Cockpit and bow cover - snap on Cup holder/Rod Holder Seadek soft flooring on swim platform and through the cockpit Underwater lights Wakeboard tower GPS chartplotter Stern mounted stereo remote Wetbar Portside aft lounge seating Dual battery switch and two batteries Pump out toilet. 2000 Monterey 322 Cruiser Everything you need in a cruiser, including a generator and the larger 454 Engines. Also many new options have been added recently! This 322 Cruiser is sporting an all new canvas including a full camper enclosure with zip out eisinglass side curtains all the way around. Also new Sea Deck flooring in cockpit and swim platform along with updated cockpit lighting. She has a super sharp cruiser look especially when she races across the water at 55mph due to its twin Volvo 454's and Volvo dual prop outdrives. 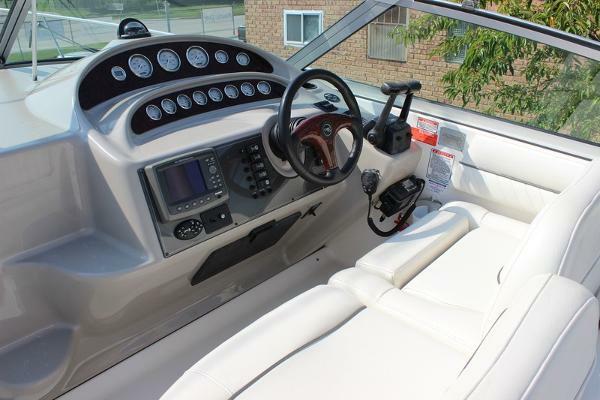 When you're not cruising around the lake you can enjoy this boats spacious cabin and galley area. The Monterey's layout boasts ample counter and table space in the galley which seats 6 comfortably. The forward berth has queen size mattress, the aft cabin has twin beds with lots of head room and you will find tons of storage throughout. The head has a pump out toilet and stand up shower. This boat comes equipped with: a windlass anchor, dual bank battery charger, ac and heat, Ritchie compass, Hummingbird depth sounder, Sea Fire fire system, Furuno 1650 DF GPS, Onan 6.5 generator, Ice maker, Furuno radar, search light, large swim platform, stereo, and West Marine VHF radio. Call today before this new listing is gone, she is priced under the recent survey market value of $64,900.